Last major update issued on June 23, 2005 at 04:30 UTC. The geomagnetic field was very quiet to unsettled on June 22. Solar wind speed ranged between 286 and 362 km/sec. A disturbance began late in the day. Early on June 23 this appears to be the arrival of a high speed stream from CH171. Solar flux measured at 20h UTC on 2.8 GHz was 79.5. The planetary A index was 7 (STAR Ap - based on the mean of three hour interval ap indices: 6.8). Three hour interval K indices: 22121123 (planetary), 22120113 (Boulder). Region 10779 decayed and rotated partly out of view at the southwest limb. Region 10780 decayed slowly and was mostly quiet. 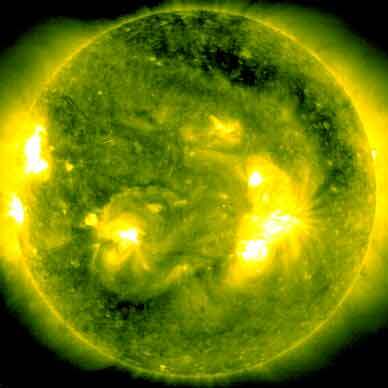 Flare: C1.8 at 16:33 UTC. June 20-22: No obvious fully or partly Earth directed CMEs were observed in available LASCO images. A recurrent coronal hole (CH171) in the northern hemisphere was in an Earth facing position on June 20-22. 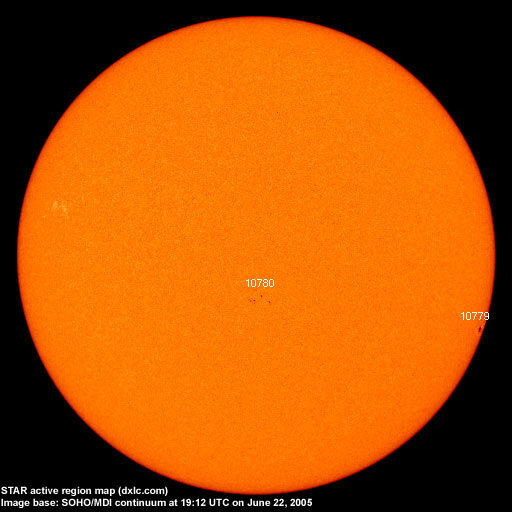 The geomagnetic field is expected to be unsettled to minor storm on June 23-24 due to a high speed stream from CH171 and quiet to unsettled on June 25. Long distance low and medium frequency (below 2 MHz) propagation along east-west paths over high and upper middle latitudes is poor. Propagation along long distance north-south paths is fair to poor. Trans Atlantic propagation conditions are normally monitored every night on 1470 kHz. Dominant station tonight: Radio Cristal del Uruguay. On other frequencies most of the observed stations were from Brazil with 920 and 970 kHz having the most interesting signals.